The Benelli TNT 300 is the entry level motorcycle from the newly launched Italian marque. 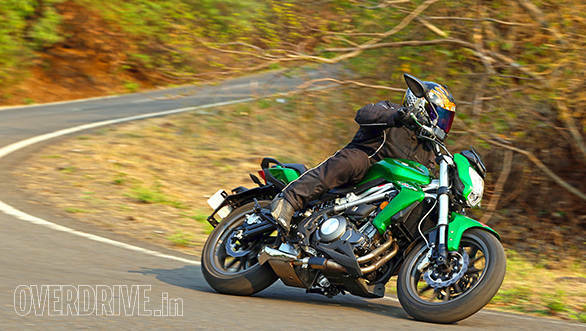 It's powered by a parallel twin engine displacing 300cc and making 38PS and 26.5Nm. 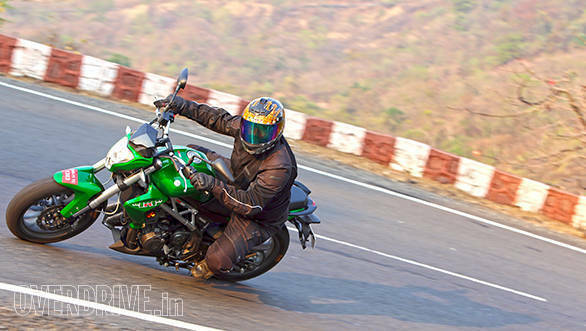 It's been priced at Rs 2.83 lakh ex-Delhi and will compete with the likes of the Kawasaki, the. Post its launch in India, we managed a ride and here's our first impression. 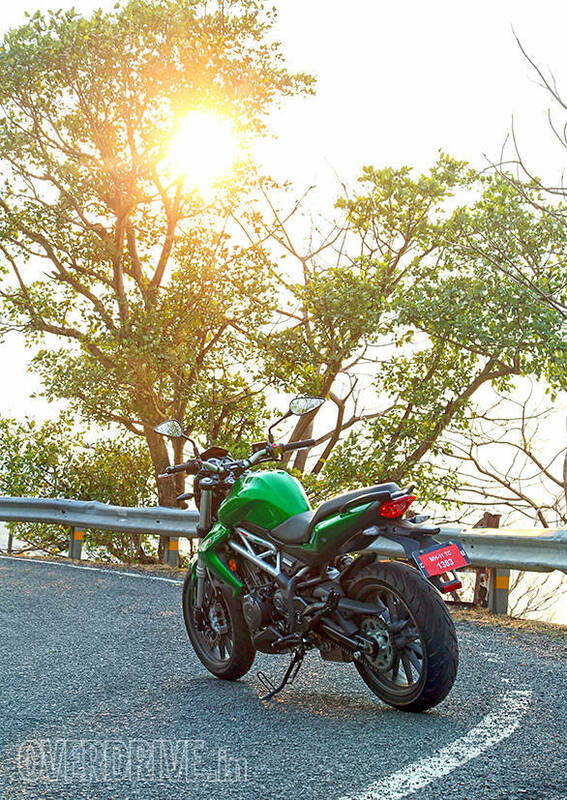 At first glance it's a fairly good looking motorcycle and quite striking in this lovely Benelli green. Up front, there's a set of 41mm, upside down front forks and two 260mm front discs. The headlight unit reminds me of the Kawasaki ER-6n with vertically stacked lamps and pilot light units. There's a large 16-litre tank that will give it a decent touring range and this complements the large comfortable looking stepped seat. The rear shock is mounted on the right hand side of the motorcycle, again reminiscent of the naked Kawasaki middleweight. The rear tyre is a wide 160mm unit that finishes up the 'big bike' look quite nicely. 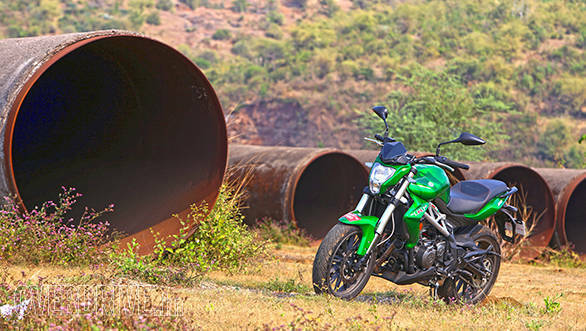 DSK-Benelli is offering the TNT with either Pirelli or MRF tyres though the MRFs are 10mm narrower, both front and rear. There is a price difference of nearly Rs 10,000 depending on whether you choose the Pirelli shod 300 or MRF. The overall build quality and the nuts and bolts used to put the TNT 300 together are really quite good for an entry level motorcycle. But there are some parts that we feel could be better finished. The welds on the trellis frame are not the neatest and some of the plastic parts, like the top of the tank and the point where the rear shock meets the frame could have been better designed. It's also a fairly safe design and a slightly more adventurous look like the over the top, dragonfly-like TNT 899, wouldn't have hurt. At this price, the omission of ABS is surprising and demonstrates that the CKD duty structures are still not quite suited for smaller displacement motorcycles. 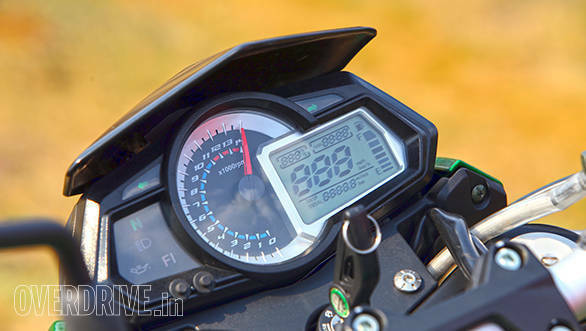 When you climb on, you're again reminded of the ER-6n with high, flat bars and a comfortable upright seat-to-peg ratio that make for a great for all-round riding position. The Italian starts up with a nice low growl from the liquid cooled parallel twin. But once you're on the move, you soon realise that you're going to have to work for those 38PS because, like its 600cc sibling, the power and torque arrives way, way up the rev range. Peak power is made at a lofty 11,500rpm and peak torque at an equally high 10,000rpm. Quite like the Kawasaki Z250 it's up against, it's perfectly happy pottering around town, but when you do decide to whack open the throttle below 7,000rpm it does take a while for the excitement to arrive. Keep the engine spinning over 7,000rpm though and throttle response is much improved and the close ratio gearbox keeps you interested. At lower revs it's quite refined but vibrations do creep in as the revs rise. In comparison, it's not as smooth as the Suzuki but it's calmer than the KTM. It's a neutral handling motorcycle and while it's not quite as flickable as the Z250 for example, it's very stable through corners. On right handers I did find the exhaust grinding far sooner than the foot pegs on the left hand side but that's mostly due to my weight and for heavy riders, an adjustment to the preload should sort this out easily. The rear shock is also adjustable for damping and this allows you to change the nature of the ride quality at the turn of a nob. The standard setting was a little hard and a couple of clicks softer made for a more comfortable ride. It's great on the highway too and the large tank and large seat do give it some touring creed. The twin discs up front do a great job of stopping this 196kg motorcycle. So Rs 2.83 lakh is the asking price for admission to the exclusive Italian motorcycle owners club. It does seem well built and should be a great all-rounder. It will even be a great tourer, that is if you can get past the absent midrange.